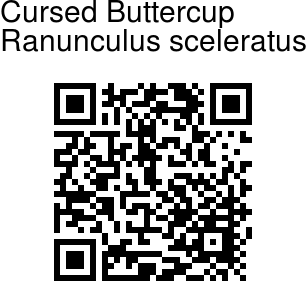 Cursed Buttercup is a fast growing annual herb which produces a multitude of small yellow flowers. 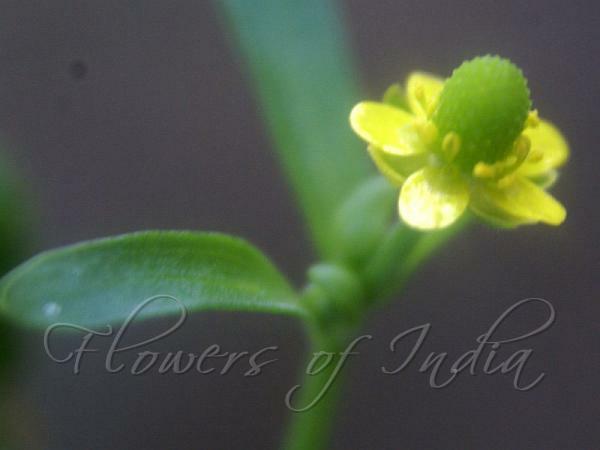 The flowers have three to five yellow petals 2-5 × 1-3 mm and reflexed sepals as long as petals. The leaves have small blades each deeply lobed or divided into usually three leaflets, and look like coriander leaves. They are borne on long stalks. The fruits arise in heads 5-13 × 3-7 mm and make the plant easy to identify. Cursed Buttercup is a very poisonous plants. Bruised and applied to the skin, it raises a blister and creates a sore which is by no means easy to heal. When chewed, it inflames the tongue and produces violent effects. Cursed Buttercupis found at altitudes up to 1700 m in Europe, C. Asia, Himalayas, N. India, Siberia, Mongolia, China, Japan, N. America. Flowering: February-June. Medicinal uses: When made into a tincture, given in small diluted doses, it proves curative of stitch in the side and neuralgic pains between the ribs.